The former party can skip this introduction and get into the meat of the review. The latter party can step to the side for a second, receive a good hard slap in the face, and then carry on reading. 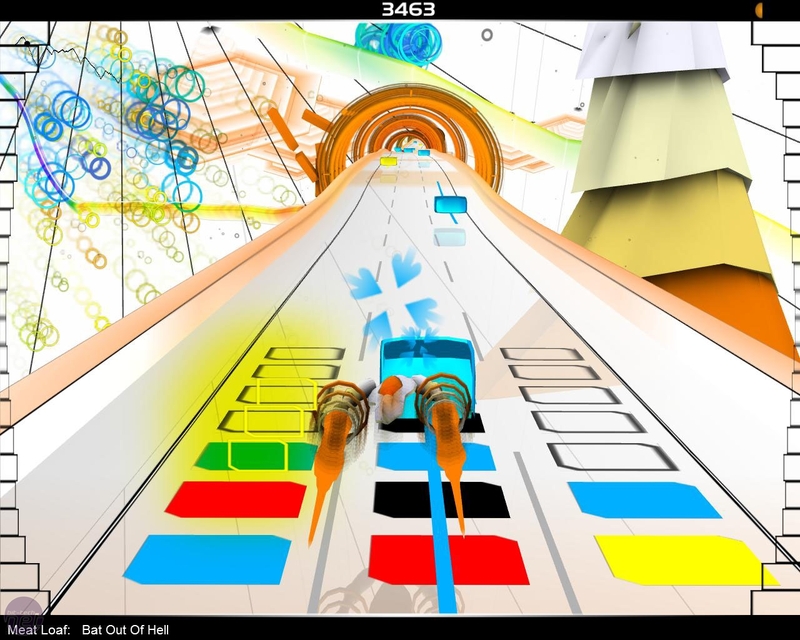 Audiosurf is not just another music game – it’s the logical extension of all music games, wrapped up and tailored especially for the best of all platforms, the PC. True, there have been an awful lot of music games lately. Guitar Hero III: Legends of Rock, Rock Band (if you’re outside of Europe) and, naturally, the re-release of Rez on Xbox Live Arcade as Rez HD. Audiosurf: It's kind of like a race-puzzle hybrid but with great music. And on drugs. Some would argue that the genre is getting tired. Those people obviously haven’t played an FPS lately – which is a shame, because there are some excellent examples we could point them to. Audiosurf is a simple game, but one that is beautifully built. Unfortunately, it’s also a little hard to explain, so while I try my best to communicate the soul of the game I suggest you download the free demo to get a little taste of the action. It’s available in the Steam Store. 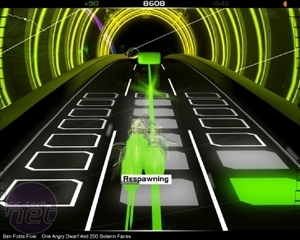 Audiosurf is best described as a music-based, speed puzzler. Players pilot a craft that rides along a rollercoaster track as multi-colour bricks fly towards them. Running over a brick collects it in a grid behind the player’s ship and, much like a simplified version of Tetris, blocks will disappear when three or more of the same colour are touching. For every brick that disappears, the player gets points – with hotter colours (red, yellow) being worth more than cold colours (blue, green). The twist is that the rollercoaster ride itself, as well as the bricks that fly at you, are all based on music. 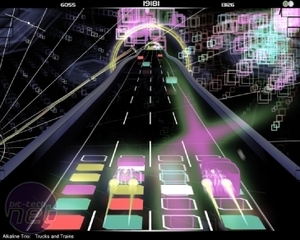 The twist in that is that, unlike games like Guitar Hero that use only pre-set tracklists, Audiosurf lets you automatically scan in any song you have. The game then reads these songs and interprets them as game levels. Audiosurf: has a plethora of modes and graphical effects to keep the music fun. Songs can be any length, type or speed – and therein lies a fraction of the game’s brilliance as players can decide the complexity, speed and length of the level they want to play. Load in a small song and the game will be a gentle, relaxed uphill meander with notes of few colours calmly floating by. Set up some trance or thrash-metal on the other hand and the level will become a raging downhill waterfall, with bricks flying at you so fast you’d think that you’d just insulted a chav. Of course, a lot of songs don’t fit perfectly into those two categories and so the majority of levels will be filled with arcs and falls that are sympathetic to the melody and in step with the beat. Without knowing exactly what’s going on players will glide through gentle build-ups, plunge down through guitar solos and smash awesomely through verses. The best part is that the game itself is focused on scores, not survival – it’s impossible to die halfway through your favourite song and have to attempt it all again. At the very worst you’ll fill up your grid and lose control for a minute while your ship respawns – you can’t die and the song won’t stop until the fat lady shuts up.